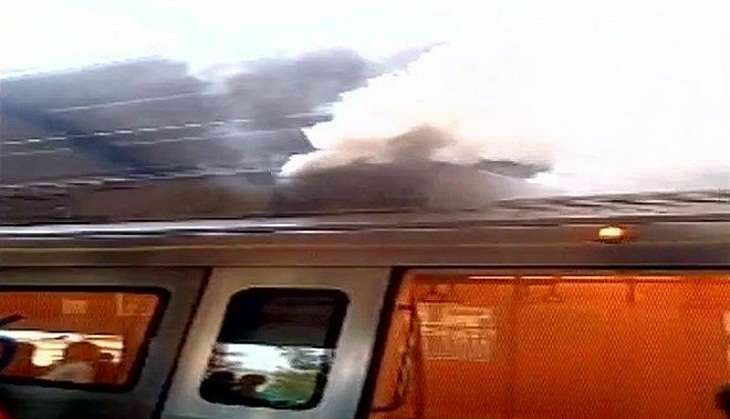 In an alarming incident, a fire broke out on a metro train at the Patel Nagar Metro Station on Delhi Metro's blue line, with plumes of smoke billowing out of the air conditioning unit of the stationary train. Passengers aboard the train were quickly evacuated, and no injuries were reported. Four fire engines were rushed to the spot to respond to the situation at Patel Nagar Metro Station. The cause of the fire has not yet been ascertained. Metro services on the blue line - connecting Vaishali and Noida to Dwarka- remained disrupted in the wake of the incident.